Let's face it, weddings can be EXPENSIVE these days - after spending money on your photographer, cake, reception site, dress.... who has any money left over to decorate? That's when you channel your inner Martha Stewart and take on some crafty Do It Yourself projects. We found some easy-to-do decor that would add an amazing pop of orange or purple to your big day without breaking your bank. Who doesn't love tissue paper poms!! And who would have thought they could be so easy to create! 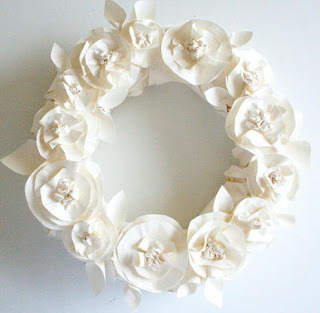 A wreath made out of butcher paper? You bet! These would be perfect for the entrance to the church -- your guests would enjoy being greeted by a creative floral display. And this wreath will last forever! 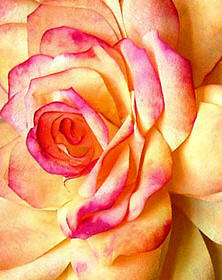 Isn't this flower beautiful? Guess what? It's made out of coffee filters...yes, coffee filters! You cannot even tell - these would be beautiful incorporated into table centerpieces, using shades of orange and purple of course. 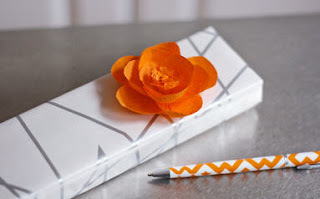 I love these little dainty orange flowers - easily made out of orange crepe paper. These would look lovely as compliments to your guests favors, or as boutonnieres for the groom and his groomsmen. I think you could find many uses for these...so pretty! I am officially a fan of fabric rossettes - and mostly because they really are so easy to make and are fool proof. You cannot mess these up! One of Clemson Girl's readers - Emily - has a cute and crafty blog of her own. 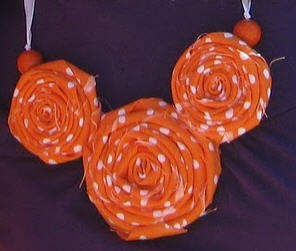 She is always doing something creative and she's generous enough to share how... like this adorable Clemson necklace she made using - yup - fabric rossettes! These would be perfect bridesmaid gifts - as necklaces or as barrettes for the hair. And create extras for your hair...and headbands for your flower girls. Or use them as part of the boutonnieres... or maybe stick a few on your cake... I could go on and on... the possibilities are endless! 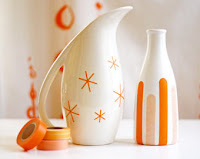 Add some orange color to virtually any favor by picking a fun and festive patterned fabric and tying it to your favor. 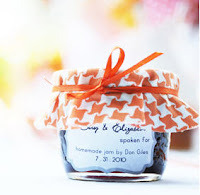 Jellies, jams, jars of sweets - all are popular guest favors and can be easily decorated when covered with a small circle of fabric and an orange ribbon. Hands down the easiest craft on the list! Clemson Girl reader Kelli and her husband eloped and spent their wedding savings on a fantastic honeymoon. 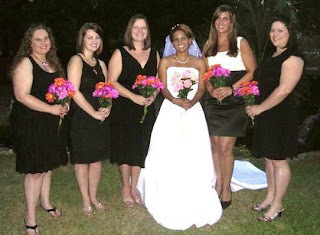 However, they decided to have a small reception later for friends and family. Not willing to break the bank, Kelli came up with a creative way to add some orange and purple to her celebration - orange and purple bridesmaid bouquets. She made the bouquets for mere dollars by purchasing orange and purple fake flowers from the Dollar Tree and wrapping them in ribbon. Photo submitted by ClemsonGirl.com reader Kelli. I love this festive heart garland - you could get married under strings of this garland, decorate your reception venue with it, or put a small strand connecting the bride and groom's chair at the reception. 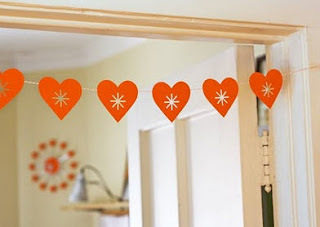 Enlist your bridesmaids to help, and you'll have yards and yards of orange heart garland in no time at all. 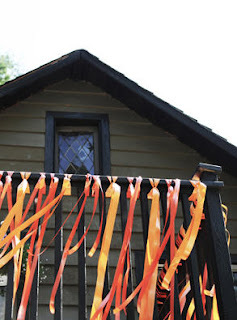 Here's another easy, easy, easy DIY project with impressive results - all you need is shades of orange ribbon. Just pick three different lengths of strands - measure and cut several strands of ribbon in each length - then simply tie each strand around a balcony, stair rail, etc. I love the look of this - especially for an outdoor wedding where a slight breeze will keep this decor moving to add to the effect. Who would ever think to use masking tape to decorate anything?? And who would imagine the results would look like they do below!? This would be great for decorating vases or votives to use for your centerpieces. Buy a few white (or another solid color - purple?) vases at the dollar store, Walmart, Target, TJ Maxx, etc. and decorate using the colored masking tape. Stick flowers in the vases and arrange on your guest tables for original (and affordable!) 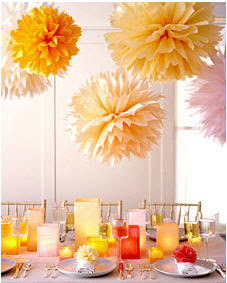 centerpieces with pops of color! Did you do any DIY projects for your wedding? Post a comment and share! We have made the tissue paper pom poms balls and had them hanging in our window display! They aren't hard to make and are super cool! Fabulous ideas! Tissue poms are so popular now at all kinds of occasions. Thanks for the rosette feature also!